In the debate over the origin of Bluebeard, the identity of the knight has been variously attributed. Some see him as a medieval serial killer of noble birth while others associate him with sundry historical wife-killers. This is an entirely understandable interpretation of the brutal acts at the heart of this fairy tale. But the story also shares many of the elements of a romance and is therefore often read through the prism of such themes: a knight seeks to win the favor of a lady, courtship and marriage follow, expectations and conflicts arise within the marriage, the plucky heroine must develop ingenuity in the face of danger and the trajectory of her personal development is traced. So how to read this "romance" that is steeped in blood, savagery and barbarism? In defense of Knight Bluebeard, I would argue that the story is not primarily about murder but rather about the cycle of life, death and rebirth. To get at the crux of this fairy tale, the blue beard of the knight offers some clues. In German mythology the beards of important proto-historical kings were often color-coded. According to folk tradition, Charlemagne had a white, pointy beard, which in some descriptions was said to be gold (although supposedly in real life he was bald and had no beard at all). Kings Otto, Olaf and Friedrich Barbarossa were said to have red beards. The color of the beard was significant because it tied the king to a specific deity. Quite often the deity was Thor or Donar. Thor’s father was Woton, the god of the heavens. His mother was Nirdu-Fricka, the goddess of earth. Thor’s realm therefore was everything in between heaven and earth. His thunder and lightening announced rain, the life-giving element essential for crops, cattle, the fecundity of the earth and life itself. Thor’s beard was red, because this was the color most often associated with lightening in the minds of many Germanic tribes. However the North Friesian and Prussian tribes referred to the blue shimmer of the lightening god. Storms were thought to unleash a blue whip or the blue flame of the god. The beard of the deity was invoked to ward off danger or curse opponents: Donnerwetter! (Thunder Weather!) Blaue Feuer! (Blue Fire!) or in maledictions: Der Donner schlage Dich! (May thunder strike you down!) The lightening itself was likened to the arrows the god shot from heaven or the wedge-shaped stones catapulted by the god with his hammer or axe. Thor drove a cart pulled by goats, which were sacred to him. The skins of sacrificed goats were hung on poles or trees as weather charms. In this role as weather or thunder god, the deity was extremely important to pre-Christian tribes. The Lithuanian thunder god was called Perkunas and he purportedly had a black, crinkly beard. Zeus was the thunder god of the Greeks and by some accounts had a white beard. The Slavonic god was known as the Striker and had a tawny colored beard. In short, you knew the god and the earthly king he was associated with by the color of the beard. As controller of weather, fertility and crops the god must have seemed fickle, capricious or even bi-polar. The bounty-bringing divinity was just as likely to send a bolt from heaven, striking the head of his victim and severing it from his body with hammer or axe. To appease such an inconstant god, sacrifices were offered. The blood or body parts of the victim were ritually poured or scattered over the ground, the carcass hung on a tree or pole or the body was burned. Animal sacrifice was common but human sacrifice has also been chronicled. It was believed these actions were essential to ward off the wrath of the god and assure the fertility of the earth. Folk memories of these rituals have been incorporated in numerous myths, but perhaps the stories of Osiris and Attis are the most representative. In Norse mythology the god Odin is both sacrificed to and sacrificed as victim. In fact the god-as-sacrifice is a common theme. These myths reflect a belief that the cycle of life-death-rebirth was crucial for the renewal of the earth. In the myth of Thor, the deity kills and consumes his goats each day. But in the evening he wondrously resuscitates them. Thus the thunder or weather god was viewed both as protector against and unleasher of evil forces. Similarly, earthly kings were judged by the bounty, prosperity or terror created during their reign. A king’s accomplishments were commemorated in folk sayings, songs and stories where his royal parentage and divine ancestry were often emphasized. But this belief in kings as divine beings was changing. When Charlemagne was crowned king, the Church anointed him as God’s representative on earth, underscoring that he was not a deity himself. This was the new party line, so-to-speak and was accepted (at least by some folk). It represents a turning point in how kings and kingship were to be perceived. In Knight Goldbeard, the otherworldly identity of the main character is suggested in the very first paragraph. Fairy tales and saga frequently use the word knight to denote a person skilled in warfare, usually of royal lineage, who is often imbued with supernatural powers. The specific knight here is further linked to the gods by the gold on his saddle and golden-threaded beard, a color frequently associated with heavenly beings. Like a god the knight freely bestows boons, favors and prosperity on the villagers. But like a fickle weather divinity, he inexplicably turns against those he favors. This fairy tale includes allusions to the sacrifices commonly made to Thor: the girl is described as laughing and jumping like a mountain goat, a reference to the animals sacrificed to the god and the sisters’ fate seems to be a direct reference to the sacrificial offerings hung on poles or trees. It is perhaps shocking to contemplate human sacrifice as a sub-text for a fairy tale, but other tales also include this grim element. The tale of the Goose Girl is probably based on a folk memory of the ritual sacrifice of horses. In the tale of Knight Bluebeard, meterological elements evoking the weather god feature prominently: Bluebeard thunders (donnerte), the brothers hasten like lightening (wie der Blitz) and they storm up the stairs (stuermten die Treppe hinauf). But this story also contains a marriage and might allude to the sacred marriage between the sky god Thor and his earth goddess counterpart. It fits neatly within the template of myths concerning a union between a mortal and a god. 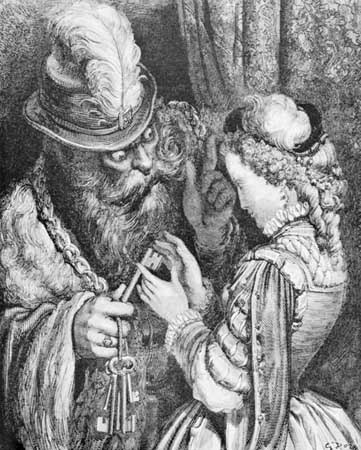 Like the Supernatural Spouse in Fairy Sisters' July Wedding, Bluebeard stipulates certain taboos as condition of marriage. But mortals are frail creatures and mostly unable to fulfill the precepts of the gods. It is the violation of taboo that brings evil, pestilence and calamity into the world. According to Jacob Grimm a very ancient pattern of story telling (and one he traces back to Aeschylus) involves a young woman who, exploring the celestial dwelling of a god, goes from room to room with a key. Finally she opens the forbidden door and unleashes the fury of the gods. It is this crossing of the threshold that often signifies a form of self-destruction for the fairytale protagonist and ultimately redemption and transformation. (Another fairy tale with this theme is Child of Mary).